ELKO, NV — Tehachapi Horn stared straight ahead at the gambler across the table from him. In the blink of an eye he drew his gun and fired two shots, two direct hits to the chest at point blank range. The gambler didn’t move an inch; Hornn walked away smiling. 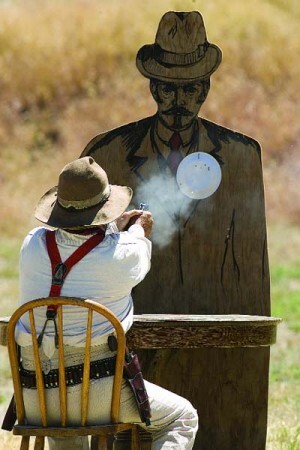 It was one of several scenes set up Thursday during the Fort Halleck Days Single Action Shooting Society event. That morning 37 gunslingers registered for the three-day Fort Halleck Volunteers event that continues today and Saturday with a shooting competition.